Three people have been arrested in connection with the lynching of four alleged armed robbers in the Mushin area of Lagos on Saturday. Ngozi Braide, the Lagos police public relations officer, confirmed the arrest saying, “A full investigation has commenced into the incident, I cannot give details about the involvement of the arrested suspects for now. The police declined to give the names of the arrested men. 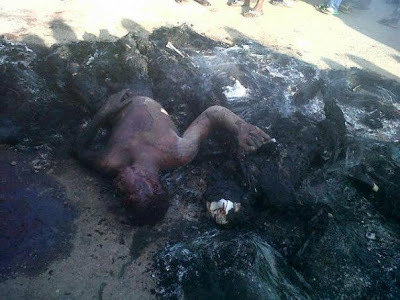 Four men were caught early on Saturday, beaten by a mob and burnt to death allegedly for robbing residents in the area. A trader who does business around the Vono area of Mushin spoke with reporters saying, “The people of this area just took their anger on the (suspected) robbers. I don’t really know how they were caught. I think they were said to have broken into a shop. Police were said to have arrived the scene after the suspects had been burnt and the crowd had dispersed. errmm, it is "Instant Justice"…"Jungle Justice" is racist! People are still lynching and engaging in jungle justice? I do not understand this at all! That is the pathetic state that we find ourselves. As if we are any better in the sight of the Lord!